The Cloud Sofa by Bracci. Features a gracefully sloped arm, tufting, and wonderfully plush and comfortable seating comfort. The headrests ratchet up, enabling you to find the perfect supportive back height to relax comfortably. The arm rest is luxuriously plush and comfortable as well. Exquisite stitching showcases Bracci's flare for unique design and attention to detail. There are two legs choices available. In the realm of quality and Italian design, Bracci is a top tier company with uncompromising attention to detail and demonstrated pride of craftsmanship. 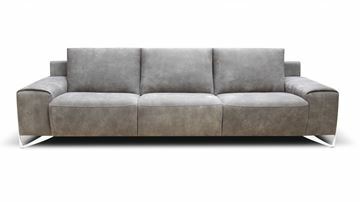 The Boheme Sofa by Bracci, a wonderfully plush and comfortable design. The Boheme features a wide arm accented by a plush flat pad atop the arm. Exquisite stitching, and a unique vertical seam on the front arm panel showcases Bracci's flare for unique design and attention to detail. There are two finish choices for the metal legs as well. In the realm of quality and Italian design, Bracci is a top tier company with uncompromising attention to detail and demonstrated pride of craftsmanship. The Clarissa Sofa by Bracci. The Clarissa features a plush tufted seat cushion, and an overall luxurious level of seating comfort. Pillows included. In the realm of quality and Italian design, Bracci is a top tier company with uncompromising attention to detail and demonstrated pride of craftsmanship.